"Solar farms are not farms"
With the return of Comm Hansen, the American Canyon solar farm was approved 3-2, Hansen, Whitmer, Mazotti for, Cottrell, Gallagher no. Comm. Hansen, noting that an ordinance is needed but not necessarily before approving a trend-setting project: "I don't think that this is building a plane while we're flying it." Maybe just building it without any plans. Renewable Properties President Aaron Halimi, the developer of the projects in Coombsville and American Canyon, indicated at the 11/28/18 Planning Commission meeting that he had withdrawn the application for the Coombsville Palm Drive project. The Planning Commission split 2-2 on their vote to approve American Canyon project and it will be voted on again on Dec 5th, when Comm Hansen returns. Two major solar farms have been proposed in Napa County. While the issue of the impact of solar arrays on the Napa landscape were raised by a couple of smaller projects, the movement of these two projects toward the Planning Commission have presented a real window into the potential impacts on our environment of this new and unregulated use of the land. One project on Palm Drive will cover a bucolic hillside in Cooombsville. The other will cover a horse ranch in American Canyon. It's churlish, and un-PC, to bad-mouth solar power. But we should recognize, as solar power provides more and more of our energy, that solar collectors are attractive only in their novelty and their benefit toward prolonging life on earth. In fact they are little different in appearance than a full parking lot. As small scale installations and solar farms begin to burden the landscape with arrays, the landscape will suffer. We see even now the jarring apparition of arrays climbing the hillsides behind homes and wineries, with little thought about their visual impact, but much admiration for the "green" commitment of their owners. And large solar arrays, as with the Palm Drive and American Canyon, are significant money makers that will further speed their adoption, particularly in areas with a lot of open space - like Napa. It is really time for a solar array ordinance to "mitigate" (I would prefer "eliminate") their visual impacts going forward. There are issues beyond just the appearance and appropriateness of the location for these types of projects. This seems to be a wild west period for the development of green energy alternatives in the state, and the County and its residents need to take a closer look at the entire ecosystem of developers, like Renewable Properties wishing to tap into the relatively new community choice aggregators like Marin Clean Energy. This may be the wave of the future, but there may also be a wave of failures before the long term solution is found. It would be shame if a string of industrial of brownfield sites tarnishes the legacy of Napa's 50 year commitment to an agricultural and natural environment. The County of Napa needs an ordinance to regulate the placement of these facilities before it begins approving them. The commitment to preserving agriculture will have been in vain if major chunks of the open space thus preserved are now available to the solar generation industry. Sonoma County has already developed an ordinance needed to regulate such projects. Napa should do the same before the first project is approved. Gene Bennetts LTE 1/21/19: Solar Farms: The Precautionary Principle--or not? Patricia Tuck LTE 12/4/18 Cui Bono? With the return of Comm Hansen, the project was approved 3-2, Hansen, Whitmer, Mazotti for, Cottrell, Gallagher no. On 12/5/18 the Planning Commission returns to render their verdict with a full contingent after the 2-2 split decision on 11/28/18. The property is currently generating income for its owners as a horse and animal farm. Will Comm. Hansen vote for the further urban development of working ag lands? Or will the county decide in its wisdom direct staff to propose regulations for this new land use before rather than after the fact? At the 11/28/18 Planning Commission meeting, the motion to approve the AmCan Solar project was split with Comms. Whitmer, and Mazotti for, and Comms. Gallagher and Cottrell against. Comm Hansen was absent. County Council indicated that given the tie the project must be agendized for the next meeting when the 5th member will be present. The project has been put on the Dec 5th agenda. I'm a bit confused by the policy regarding a tie. In the Girard project, a 2-2 tie was interpreted as a loss of the motion. In the first ALUC hearing on the Palmaz heliport, the ALUC board split 3-3 and the hearing was renoticed for a future meeting. There had to be some clarification on this because the ALUC policy was different than the Planning Commission policy. Perhaps the Planning Commission policy changed? Comm Gallagher asked at the time, why would a hearing be scheduled if the members present are potentially not capable to make a binding decision. Good question. 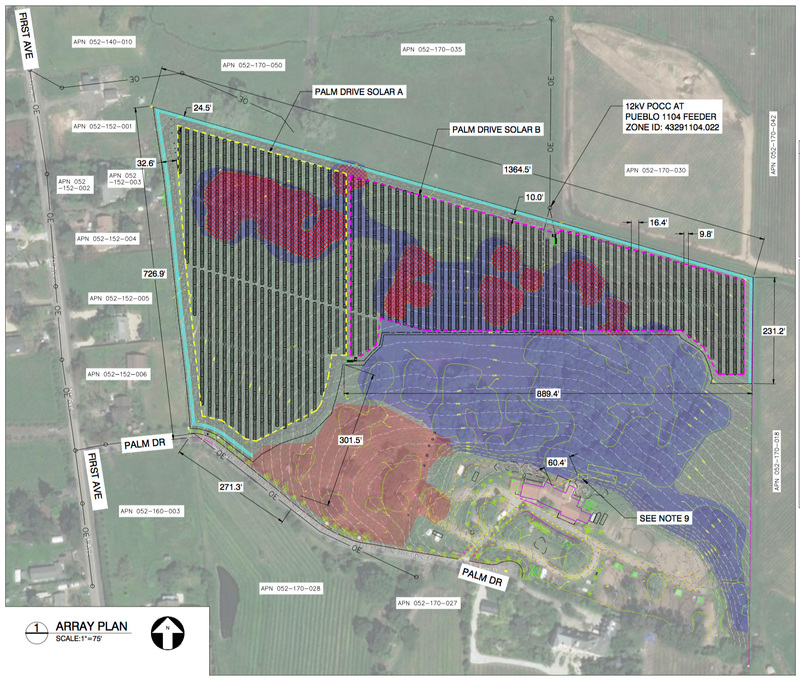 The second solar farm currently being proposed in the county will be up before the planning commission on Oct. 17th 2018. The agenda and documents are here. The neg-dec notice is here. Less-than-significant impacts as usual. 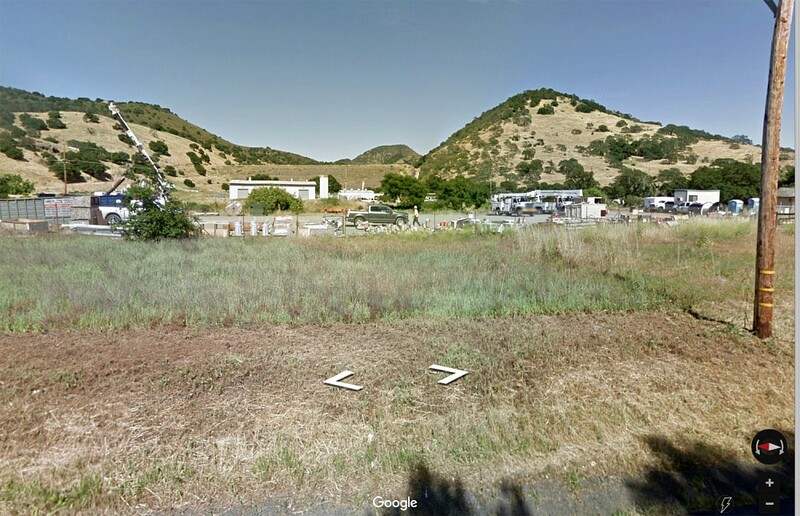 It will cover a hillside in the bucolic, actual American Canyon between Hwy 80 and the AmCan High School. Given the route, a viable alternative connection between Hwys 80 and 29, remaining a piece of the county�s unpretentious ranch landscape was not in the cards. It might have become another vanity vineyard, but in this corner of the county closer to a freeway, the most profitable crop seems to be the guiding principle. If the County is willing to consider solar power plants as an acceptable use on ag lands, there are 45000 acres of land in the county already cleared with the intention of soaking up the sun waiting to be developed into more profitable use. According to one website, leasing farmland for solar collectors might produce a net profit of "somewhere between $21,250 and $42,500 per acre on an annual basis". Compare that to the $7000/ton x 4 ton/acre = $28,000/acre gross revenue from vines in Napa County. With costs of perhaps $16000/acre that would leave $12000/acre/yr net profit, far below the money to be made from a solar farm. While not every farmer would be interested in doubling their income by converting to solar power, there is definitely an incentive to do so. There is a real need for the County to develop a policy and ordinances for solar development before any projects are considered for approval. Sonoma County already has an ordinance. This question needs to to be answered first: why should agriculturally zoned land, the "highest and best use of the land" in the County's oft-touted phrase, be used for power plants rather than relegating such an expansive industrial use to industrially zoned land? This illustration shows the size of the American Canyon solar array (18 acres large) in comparison to the ultimate Napa Logistics buildout. The array is about 3/4 the area of the largest building in the complex. The County should ask why solar collection can't be incorporated into industrial or commercial uses to offset the costs of both, as rooftop or parking lot installations (as in the Gasser HQ parking lot)? Would it not make sense to initially target large solar power projects for the industrial areas and uses that need generous amounts of power to operate, and leave ag lands for ag uses? 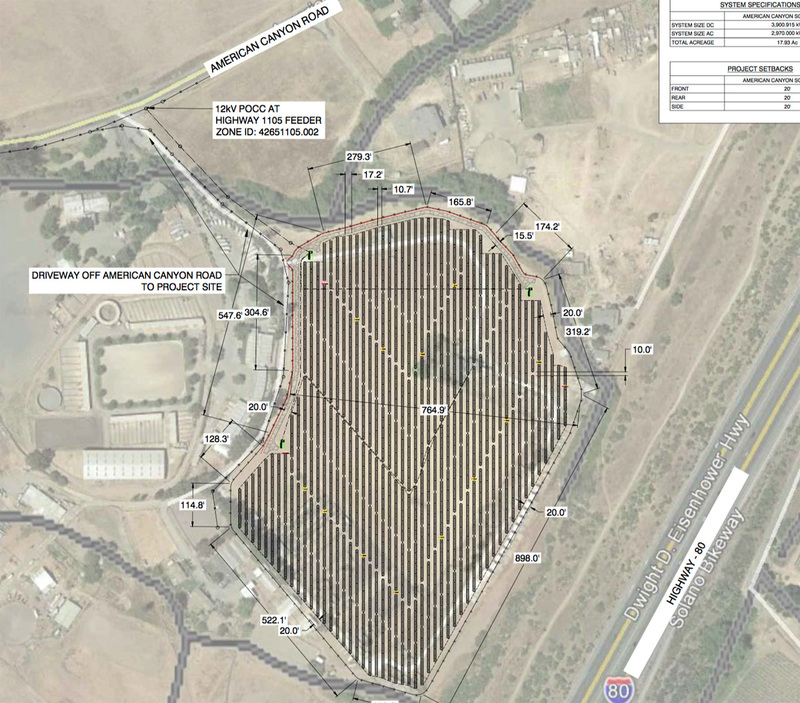 At the 11/28/18 hearing on the American Canyon Solar Project, the developer indicated that they have withdrawn their application for the Palm Drive Solar Project. Temporary or permanent? Another community group has formed to oppose the urbanization of the "agricultural lands and rural character that we treasure", this time to prevent a wooded hillside in Coombsville from becoming a power plant. It is Napa Residents for Smart Planning�No on Palm Drive Solar. Their very well done website does a good job of showing how inappropriate such an industrial project can be to a rural landscape. The red splotches are stands of oak woodlands to be removed. Given the concerns raised by the Measure C campaign over the last year it is a bit shocking that a company would have the hubris to push forward such an industrial use of Napa's oak woodlands. The plan is one of the documents on the County's Palm Drive Solar page. I am deeply concerned about the prospect of placing large commercial solar panel arrays in the Ag Watershed and Ag Preserve. The two projects presented by the developer, Renewable Properties, and currently under consideration by Napa County Planning Staff, Planning Commissioners and the Board of Supervisors are the Palm Drive Solar Project and the American Canyon Solar Project. Planning Staff has agreed that �the magnitude of this project is beyond the scope of our zoning regulations.� The proposed solar projects, while presented as a utility, in reality, would be privately run manufacturing facilities that transform sunlight into electricity which is transferred to the grid. These projects are truly incompatible to the beauty, biodiversity and bucolic nature of the Ag Watershed and Ag Preserve zones. The destruction of native mature oak trees whose ability to capture water and nurture species� habitats is unacceptable, especially in this age of climate change. Removing oak trees and replacing them with solar panels that change the microclimates are counter intuitive to Napa County�s and the community�s concerns about climate change. The County hasn�t explored and doesn�t have the expertise to make decisions about the health and safety impacts of this type of technology to be constructed on this proposed scale in the Ag Watershed and Ag Preserve. 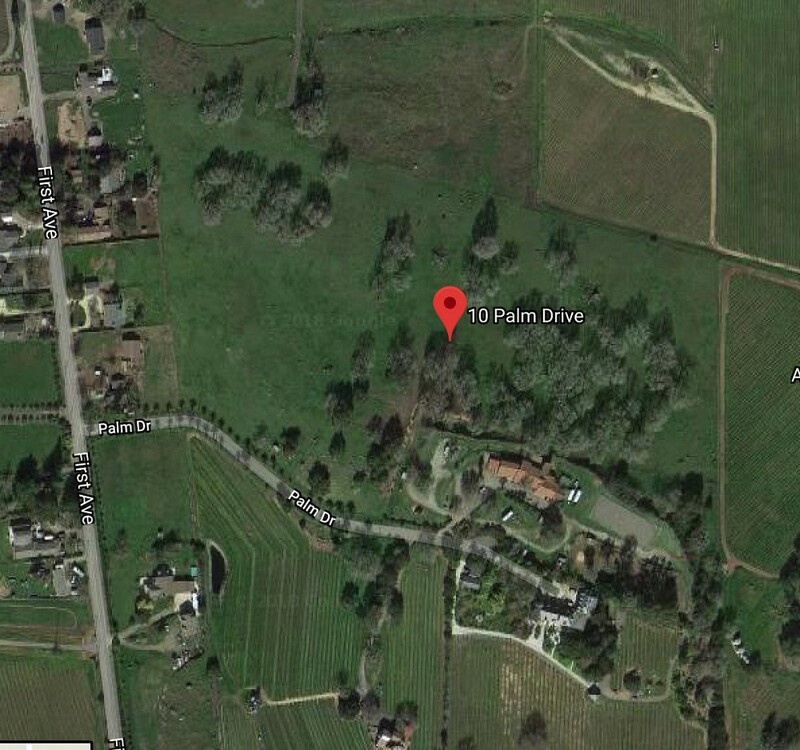 The Palm Drive project will have significant and permanent negative impacts on the aesthetic, economic and environmental qualities of Napa County. The removal of 3.5 hillside acres of mature blue oaks for non-agricultural, private financial gain will have a deplorable impact on the viewshed and impinge on the quality of life for that neighborhood and potentially Napa County. This proposed project would set a precedent for similar developments on non-cultivatable land for the entire county. There is nothing about this site location that is good for our environment, quality of life, or our economy. The American Canyon site appears to be more suitable for this type of project, but it is also located in the Ag Watershed. Approval of this project will set a very alarming precedent for future projects in all of Napa County. I believe that citizens need to have a voice in this issue. I am not opposed to all commercial solar, but Napa County has no regulations in place for a project that is expected to last thirty years. The Winery Definition Ordinance was created to define, refine and regulate wineries. The Conservation Regulations were created to regulate vineyard development. Why should solar farms be any different? Neighboring counties have created ordinances or taken a stand on this matter. Napa County is ripe for commercial solar development and the long - term consequences of this decision haven�t been thoroughly considered. Marin County Supervisors made a decision on solar energy recently, and I believe that Napa County is in the exact same position with regard to these two solar projects. The Marin County Supervisors made their decision based on the very point that Marin County is not equipped to make this decision. Napa County�s current zoning regulations don�t address or provide for consideration of this kind of project in the Ag Watershed and Ag Preserve. Sonoma County, which is significantly larger than Napa County, has reviewed their zoning regulations with regard to solar in their valleys and on their hillsides. They�ve drafted their zoning ordinance to address the issues that solar brings to the forefront. They�re similar to Napa County in that they have as much natural beauty to protect and preserve and as much to lose by not doing so. Napa County is allowing more and more development into the hillsides which equates into removal of mature oak woodlands. Walt Ranch is already one devastating environmental project that has been approved by the County with little regard for neighbors or water issues. The Palm Drive project will open the doors for more financial projects into the hillsides and watersheds when consideration should be given to saving mature trees, not cutting them down. The Planning Staff, Planning Commissioners and Board of Supervisors should NOT create a precedent by approving or recommending either of these projects without taking an opportunity to appropriately revise county zoning regulations. With no ordinance yet in place for a project of this magnitude, this project is detrimental to many residents and the agricultural land itself. To name a few problems: there is no minimum parcel size, no setbacks, no limits on percentage of parcel coverage, no viewshed protections, and the long term implications of this type of decision have yet to be considered. I encourage the County, as it redrafts the Climate Action Plan, to initiate and develop solar power that is generated on site and remains within our region. County owned rooftops, parking lots and the Napa County Airport are just a few examples of the many suitable sites for solar panels in which the county government could take the lead. It is our elected and appointed officials, rather than private individuals, corporations and developers, who should be accountable for creating regulations with substantial input from citizens. 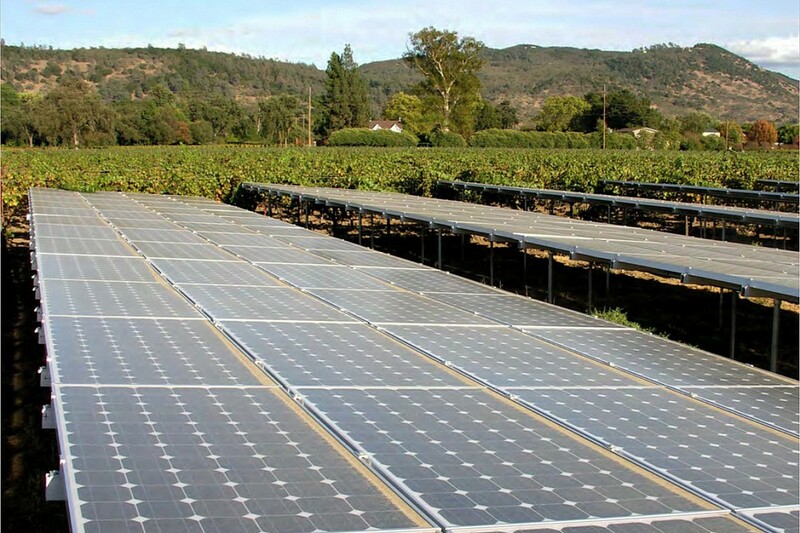 The Napa County General Plan states that �Napa County will be a place where agriculture is the primary land use and where a vast majority of the county is open space....� The Renewable Properties solar farm proposals are inconsistent with the General Plan and should be denied for that reason and far more. Until county zoning regulations are revised to incorporate solar farms, approval for these projects should be denied or postponed. "How many of you remember when PG&E announced they were installing high voltage transmission lines to expand their interstate power grid. Power lines that would bisect the valley crossing Hwy 29. It didn�t seem like we had a choice but the community and electeds responded with a resounding HELL NO. Somehow PG&E found another path to support the grid and we were spared. Why do I bring this up? Because tomorrow brings a unique opportunity and a similar threat. A private developer has an application for a Solar �Farm� in a remote corner of Am Cyn near Hwy 80 on an AW parcel currently used for horse boarding and training. 21 acres with 18 acres of solar farm. How can this be? An exception exists to all zoning codes for electric production without limitation. AG/LU 29 states public utility shall be permitted in �appropriate� locations. But, the applicant is a private developer not a public utility. Let�s be clear. Solar Farms are not farms, they are commercial production facilities that convert sunlight into electricity and then sell it (in this case to MCE). We are familiar with production facilities � we have 100s called wineries. They have regulations, guidelines, and clarifying memorandums and, more importantly, support agriculture. The Am Cyn site may be �appropriate� (although we have no definition) � but it sets a precedent that may be impossible to challenge for the next application, or the one after that - which could very well be on Highway 12 or 29, Silverado Trail, Old Sonoma Road � just to name a few. Tomorrow, I will ask the Planning Commission to defer a decision until you, the Board, set direction & policy. Similar to the recent workshop on Rural Wineries (on your agenda today). Thank you for your support on the issue." As previously said, time for a solar array ordinance. It is appropriate to ask why a major solar panel installation is being proposed in a rural residential neighborhood and requiring the removal of oak woodlands rather than in the industrial zoned areas of the county, perhaps shading some of the mega parking lots to be built there. Solar panels may slow down the suicide of the human species but they are not neighborhood or viewshed friendly. Fortunately a review by the planning commission at an as yet unspecified date will give the community a chance to weigh in on this very inappropriate site. Exactly the solution needed for the Rector dam corporation yard! The Trail is already filling up with garish homes and event centers and parking lots and left turn bumps and now the indignity of an industrial power plant. As every home and business begins to burden the landscape with an array, the landscape will suffer. We see even now the jarring apparition of arrays climbing the hillsides behind homes and wineries, with little thought about their visual impact, but much admiration for the "green" commitment of their owners. And large solar arrays, as with the half acre at Rector, are significant money makers that will further speed their adoption, particularly in areas with a lot of open space - like Napa. It is really time for a solar array ordinance to "mitigate" (I would prefer "eliminate") their visual impacts and potential consumption of ag land going forward. About the Rector array: this is an ideal opportunity to propose a 6-8' berm (a modest bit of earthwork perhaps garnished with vines) at the front of the property to hide both the panels and the corporation yard with its industrial detritus. It could be constructed perhaps with a bit of the 1400 acre feet of silt washed down from the vineyard development in the hills that currently diminishes the capacity of the reservoir. A definite win-win for all.